Imagine you’re tapping out a telegraph the next time you write your landing page copy. Image by Everett Collection via Shutterstock. 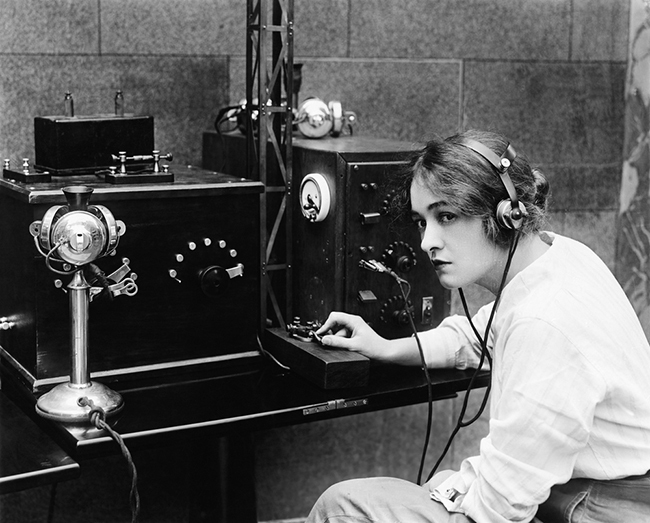 BLUF is originally a military communications technique, in which the conclusion — the most vital information and actions — is placed right at the start. giving the reader what they need to make an informed decision (respect people’s time and intelligence and they’ll respect you). Starbucks proving that sometimes less is more. When the folks at Starbucks released their Italian-Style Ham & Spicy Salami sandwich in January, they knew that all they really needed to do was show the sandwich and tell you what’s in it. Throw in some colorful words, like handcrafted, splash and tangy, and you’re salivating. This is BLUF. Starbucks has given you everything you need to know about whether this sandwich is for you, all in about 30 words. If you really want to “Learn More”, you can (it has 480 calories and little pickled peppers, if you’re interested). Now that you know what BLUF is and have some idea of how it works, let’s look at some more examples, and then how to put BLUF into practice on your own landing pages. Get ready to nerd out. Craft killer BLUF-inspired copy that converts with this FREE downloadable worksheet. By entering your email you'll receive weekly Unbounce Blog updates and other resources to help you become a marketing genius. Gumroad’s landing page is a strong example of BLUF, giving visitors the pertinent info they need right up front. Sell music directly to your listeners. See higher conversion, lower fees and more customer control. 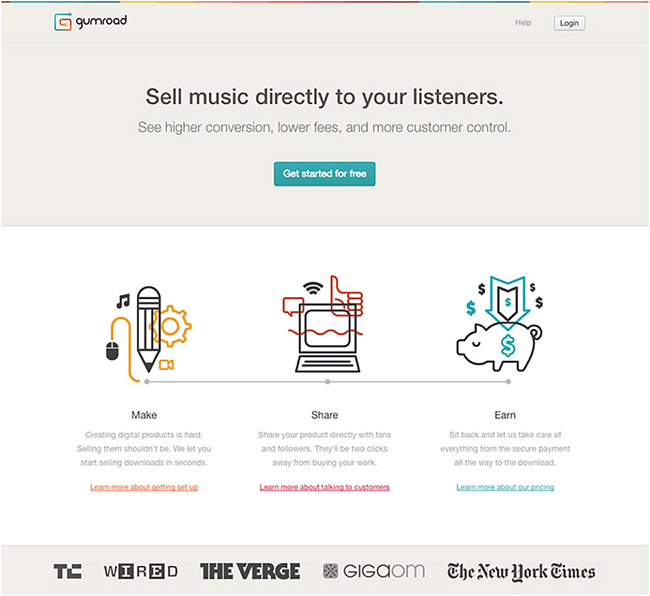 Gumroad’s bottom line is that it allows musicians to sell directly to listeners. That might be enough for some people, but the landing page includes some key features of the service, like lower fees and the possibility of higher conversions. If you’re a musician, Gumroad is sounding pretty good by now, so the next logical step is to attempt to seal the deal by inviting you to sign up for free. There’s more information in the page section below if you’re in need of a bit more convincing, but essentially everything you need to know to make a decision is right there up front. Human recognizes that we humans have very limited attention spans. Human’s BLUF is even simpler than Gumroad’s; its app will encourage you to do 30 minutes or more of exercise every day. 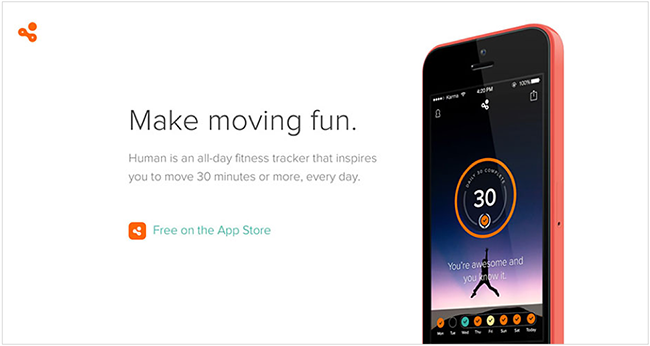 It’s a fitness tracker that feeds you little nuggets of praise, pushing you to do more. Like Gumroad, the copy on Human’s landing page passes the Blank Sheet of Paper test, giving visitors only the bare necessities in order to make a decision. Again, the call to action mentions that the app is free to download, making it harder to refuse. What if the thing you’re offering is complex? Further, what if you want to highlight the fact that it’s complex, but still have people understand it? All the more reason to use BLUF. Nothing changes. The Dyson team prides themselves on making things that are intuitive and easy to use. They also want you and the competition to know that there is absolutely nothing else like a Dyson. They’re not shy about giving you the technical details, but look at how they do it. 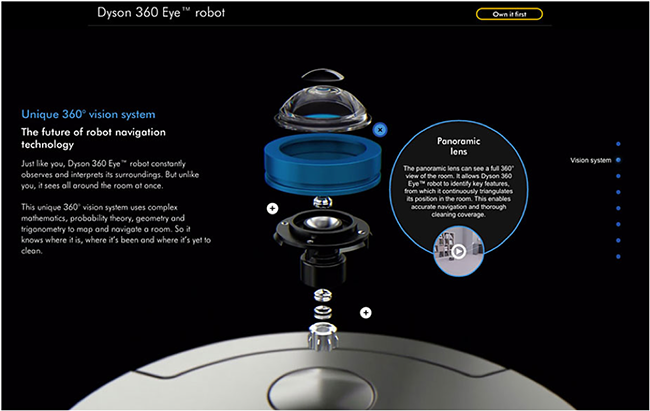 This unique 360 vision system uses complex mathematics, probability theory, geometry and trigonometry to map and navigate a room. So it knows where it is, where it’s been and where it’s yet to clean. Dyson effectively blends simplicity using the BLUF tactic with the complexity of it’s high-tech product. Nobody who’s just looking for a bog-standard vacuum cleaner is going to be interested in the ins and outs of the 360 Eye — or its $1,200 price tag. The people who are interested in this cleaner are gadget geeks and tech brains with money to burn. It uses trigonometry to figure out that it still needs to clean near the fridge. Planning what to write on your landing page with BLUF is easy. invite me to learn more, sign up or buy. If I want to know more, I can scroll, but if you can fulfill my need convincingly right there in your opening, I’m less likely to visit somebody else’s landing page, right? Consider this: How often do you stare at an article or landing page and have no idea what you’re reading? Let’s avoid that. Visualizing your thoughts and features like this starts to give you an idea of what your conclusion, key points and actions might be. It’s the framework for your BLUF copy. Access your money anywhere. Trade business invoices in any currency. Outlining your copy first can be useful for informing your design. It’s something that copywriter Alastaire Allday talks about in his ebook, Think Like a Copywriter. 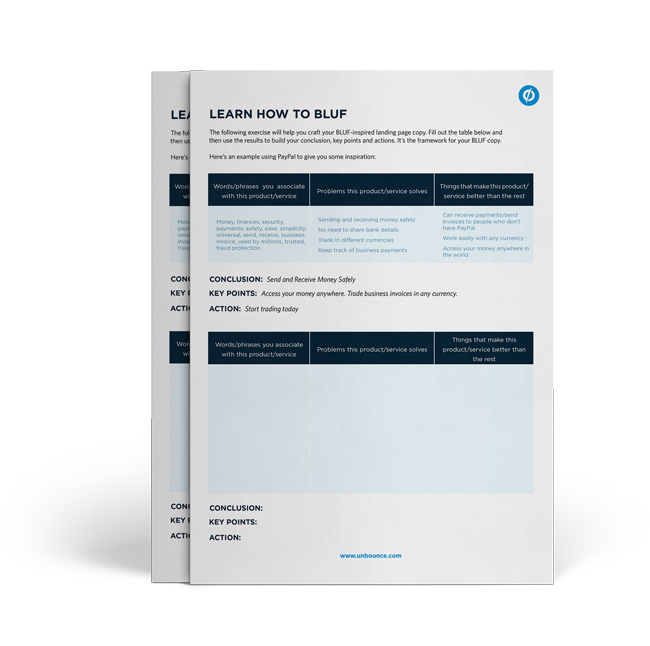 The essence of BLUF is about giving your reader the information they need right away, and allowing them to make an informed decision about a follow-up. While being so scant in your introduction may sound scary, just like in dating, confidence pays off big time. It’s much easier for people to buy into your idea when you’re completely behind it yourself. You still need to be descriptive, but highlight your best parts straight away. Don’t beat around the bush. Good luck using BLUF to take your landing page copywriting to another level. Graeme is a copywriter and content marketer who also writes scary fiction. Contributor at Success Magazine and Entrepreneur. Here's his website, and here's his Twitter.